This Monitor Stand that Supports 60" Wide Screen TVs and Larger is Ideal for Any Location! This Monitor Stand Can be Added to Your Home, Office, Place of Business, Restaurant or Other High Traffic Setting! Browse the Online Store for Television Stands! The monitor stand that displays a 60"-84"+ flat panel TV is VESA compatible for 200mm x 200mm through 1200mm x 400mm. 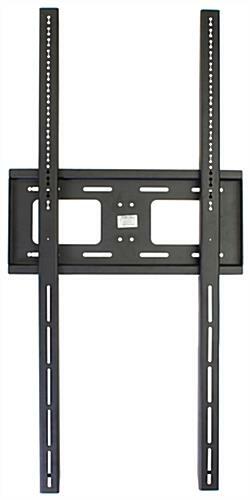 Each large mounting arm is 49" long and can accommodate sizable televisions in portrait orientation. This flat screen LCD bracket, monitor stand that is VESA compatible comes equipped with the necessary hardware for mounting most televisions on the display. However, some plasma monitor screens may need other screws that are available for purchase at any local hardware shop! This monitor stand for vertical mounting fits a 70"-95" plasma monitor that weighs up to 176 lbs. The flat screen television display is built to hold a monitor in portrait (vertical) layout only, not landscape (horizontal). The heavy duty monitor stand, like an LCD bracket, is crafted from steel to supply a durable screen display that will last through many years of use. The steel has a powder coated black finish that easily fits in with any setting. This monitor stand that is fabricated from steel is fantastic for application in homes, businesses, hotels, offices and even restaurants or bars. The black powder coated mounting brackets add style to any location!